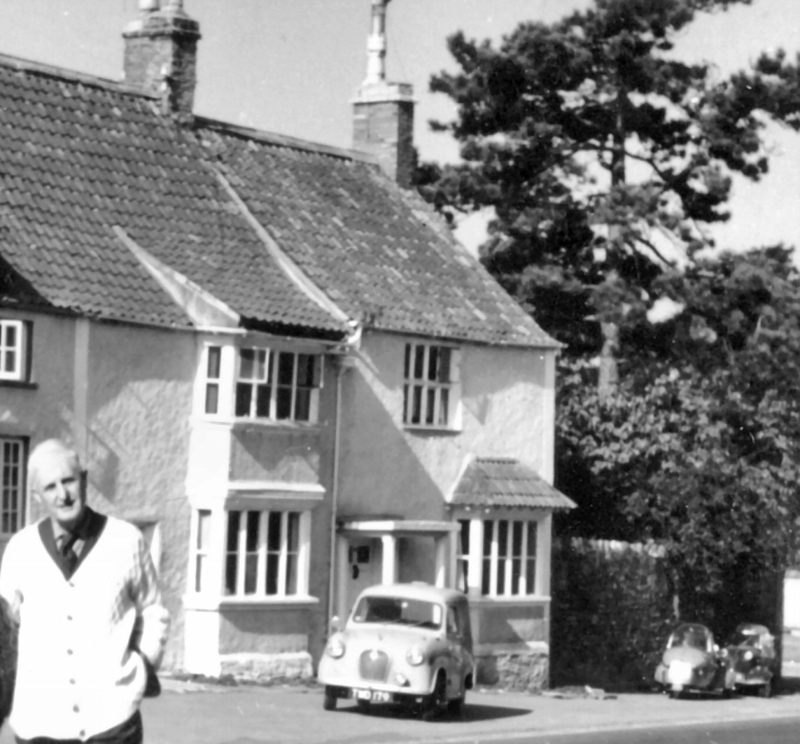 The Priory in Castle Street, Thornbury has a long and seemingly interesting history. Sadly we have never seen inside this house, nor have we seen many of the deeds that relate to it. We know at least some of the people who occupied this lovely house and have listed below what we know of them. Henry Baker. In his will dated 11th January 1808, John Crowther (the then owner of property that included The Priory) referred to the fact that the house and yard and the two closes of land associated with the house were occupied by Henry Baker. “Occupied” in this sense means that Henry Baker was a tenant. The problem with the early records is that the land is more important than the house. The ownership and tenancy of the land is detailed but not necessarily that of a house. This makes it difficult to be sure that the person “occupying” the land attached to or near to the house actually lived in the property himself. Sometimes even if the house was part of the property a house could be sublet to a third party! Despite all these caveats it seems likely that Henry Baker was living in this property even before the will of John Crowther. The 1809 rent roll shows that Henry Baker was a tenant of “Latteridge“ which was owned by John Crowther. This is a close of land next to The Priory but not necessarily The Priory itself. The land tax record of 1800 shows that Henry Baker rented a valuable property from Arthur Taylor. In 1809 and 1810 he rented what appears to be the same property from Arthur’s widow, Elizabeth Taylor. The land tax records show that from 1812 if not earlier Henry Baker rented a large area of land from Joseph Yates. This is the same area of land that he rented earlier from Arthur and then Elizabeth Taylor. In 1814 he rented this property from Joseph Yates as well as the house we know became The Priory from Benjamin Smith. The plot of land was near to Thornbury Villa. We have traced some records of a Henry Baker who lived in Thornbury at this time. Although we are aware that the dictionary definition of this word is a net to catch birds, in most instances we have found this to be an alternative spelling of “haulier” and it probably means that he had a business which involved delivery with by horse and waggon. By 30th March 1808 when Harriet Baker was baptised Henry was described as a “hallier and farmer.” This ties in with the fact that Henry Baker is known to have rented The Priory and two large closes of land. Elizabeth Baker was baptised 26th May 1811 and again her father was Henry Baker a hallier and his wife was Sarah. This information presents a happy picture of a large and thriving family with a farm and horses and a waggon. However there are indications that all was not so good. There is a memorial inscription in St Mary’s church yard which tells us more. Sadly such early deaths were not uncommon at this period. In 1821 the list of women who received gowns from the Mayor’s charity included a lady called Sarah Baker. We are not able to confirm that this is the same Sarah who was married to Henry Baker but the presents were given to the “deserving poor.” If it was her, it certainly suggests that the family had financial difficulties. Sarah Baker aged 58 was buried on 19th October 1823, according to Scribe’s Alcove but we have no record of the grave. Henry Baker also received gifts from the Mayor’s charity in 1820 and 1823. We have found no record of the death of Henry Baker in Thornbury. We know that when The Priory and its land were sold to Adrian Stokes in April 1822 the house was occupied by Thomas Smith and it appears that Thomas Smith had lived there from about 1819. Thomas Smith. The 1841 Census shows us that Thomas Smith was aged 61 and a carpenter. His wife was Mary Smith who was then aged 55. They had a son called John aged 28 living with them. Eliza Smith, aged 21 and Thomas Smith aged seven months were also in the household. Scribe’s Alcove website shows that Thomas Smith was baptised 27th January 1841 and was the son of John Smith, a carpenter, and his wife, Eliza. This means that the three generations of Smith were living in what is now The Priory. We know that the land tax records of 1819 show that Thomas Smith senior, prior to being a tenant of Adrian Stokes, was a tenant of James Smith and that an indenture of 1822 confirms that this is the property known as The Priory. We believe that Thomas Smith was brother of James Smith the then owner of the house and the son of Benjamin and Betty Smith. George Hoare. The 1851 Census shows us that by this time George Hoare and his wife Ann had moved into what is now The Priory. George was born in Ringwood, Hampshire about 1808 and he was a schoolmaster. Ann was born in Shropshire about 1800. They had one son, George born in 1837. The 1849 and 1852 Thornbury Trade Directories show that George Hoare was a schoolmaster of a Day School. On 22nd October 1834, George Hoare had married Anne, whose surname is uncertain, possibly Jehn, in St Mary’s Church in Thornbury. In the Tithe Apportionment that accompanies the Tithe Survey map of 1840 the property that later became 4 Horseshoe Lane was said to be occupied by George Hare. We believe that this was a mis-spelling of George Hoare. At the time of the 1841 Census George Hoare, a schoolmaster was living with Elizabeth Jane Ward in Bull’s Lane (later known as 7 and 9 Bath Road). She was described as being of independent means aged 61 and born outside of Gloucestershire. There must be some family connection between George Hoare and Elizabeth as she was a witness as his wedding in 1834. Elizabeth Jane Ward later lived at 81 High Street. At the time of the Census George was a master in the British School. By 1851 he and Ann had moved to live in The Priory in Castle Street. The 1861 Census shows George Hoare then aged 53 had moved and was living with Anne then aged 60 in Market Square in Ringwood in Hampshire. George was described as a schoolmaster in a private school. They had three boarders Sarah Worden, an assistant school teacher aged 28, and two children Sidney aged 13 and George aged 7, both scholars. George died in Ringwood on 18th August 1865 and was buried in Crosslanes Chapel Cemetery there. Ann and her son seem to have moved again as by the 1871 Census shows that young George was a commercial traveller in the drapery business. He was living in the Newington area of London and his widowed mother, Anne, now 70 years old was living with him. George Hoare junior died 22 July 1873 aged only 37 and was buried with his father. Ann Hoare died less than three years later on 6th May 1876 aged 76 and was buried with her husband and son in Ringwood. Thomas Powell. By 1859 the rate book shows that Thomas Powell owned and occupied the Priory. It seems possible that this is an error as the indentures indicate that John Powell bought this property in 1854 and a document held in the deeds of Clematis Cottage appear to indicate that John Powell still owned it in 1867. Read more about Thomas Powell. Emma Kingdon (or Kingdom). The 1861 Census shows that The Priory was occupied by Emma Kingdon an unmarried schoolmistress of 28 years born in Bristol. She has a servant, Lydia Ann Baker aged 16 from Dorset. She seems to be sharing a house with Edward Williams a retired butcher of 64 years from Charlton in Gloucestershire and his wife Hannah from Westerleigh and their daughter Eliza aged 29 who was born in Thornbury. We believe that Emma Kingdon was the daughter of John Kingdon a wood engraver and his wife Mary who lived in Bristol in the 1841 and 1851 Censuses. Emma had a sister Julia who was a little younger than her. Thomas Henry Dodd. From 1862 to 1869 the rate books show that the house was occupied by T H Dodd. We believe that this was Thomas Henry Dodd. He was born in Olveston on 7th March 1842. He was the son of Henry James Dodd a shopkeeper from Norfolk and his wife Hester (nee Wilcox) who was from Alveston. Hester was the sister of William Radford Wilcox who had run a grocer shop at 43 High Street in the 1830s and early 1840s. In the 1851 Census the Dodd family was living in Olveston and Henry Dodd was a shopkeeper. By 1861 Thomas’s father, Henry, was a grocer, draper and outfitter in the bottom of the High Street just a little down from The Swan. Thomas Henry Dodd appeared in the 1861 census living in Poole with his sister Ann Elizabeth. They had a drapery business there which employed two assistants and a porter. In the December quarter of 1861 Thomas Henry Dodd’s sister, Ann Dodd, married Edwin Boyes Lonnen who had been lodging in Poole. Edwin and Ann Boyes Lonnen lived in Thornbury after their marriage and this seems to be the reason why Thomas Henry Dodd also came back to Thornbury. Thomas married Frances Jane Powell at the Independent Chapel (now the United Reformed Church) in Thornbury on 3rd April 1862. It was the first wedding solemnised in that chapel and the Reverend John Morgan who performed the ceremony gave them a family bible in acknowledgement of the fact. Frances had been born in Raleigh Upper Canada. Thomas Henry Dodd died in Newbury on 4th July 1867. The funeral was held at Thornbury United Reformed Church. He was 25 years old. By 1871 Frances Jane Dodd was a widow aged only 26 with a son Henry James Dodd aged 6 born in Berkeley and a daughter Annie Frances aged 4 and born in Frampton on Severn. The 1881 Census shows that Frances Jane Dodd was a widow aged only 36 who lived in Clevedon with the two children Henry and Annie. By 1891 Frances and her two grown up children had moved to Burnham on Sea. The 1901 Census shows that they remained there. William Peacock. The 1871 Census shows the house was inhabited by William Peacock, a coachman aged 39 from Goldington Bedford with Ann his wife aged 41 and their children Harry aged 13, Charles aged 12, Ruth aged 10 all born in Bedford and Adali? aged three born in Skelbrook in Gloucestershire. In the 1841 Census William Peacock was aged nine and living in Goldington in Bedfordshire with his parents Ann and John Peacock and his brother John. John Peacock senior was an agricultural labourer and the family lived on a farm which they shared with another agricultural labourer John Young and his wife Margaret. By the 1851 Census William aged 19 had left home and was living in the household of William Kenworthy Brown who appeared to be the local squire. William was a house servant. It is likely that William married in the Bedford district in 1856 but we are unable to confirm the date or his wife’s maiden name. In the 1861 Census William was still living in Goldington in Bedfordshire where he was a coachman (a domestic servant rather than a public coach driver) aged 30 with Ann and their children Harry aged three, Charles aged two and Ruth aged nine months. They had a servant Ann Young aged 18. It seems unlikely that the family moved to Thornbury much before the 1871 Census. In the 1879 Gas Rate Book for Thornbury he was shown as the tenant of Henry Craven St John. We know that William and Ann Peacock moved by 1880. By the 1881 Census the family had moved to Calne in Wiltshire and lived in the lodge of the Highlands a big house occupied by Elizabeth Kenworthy Brown a widow and her extensive household. By 1901 William Peacock was living with his daughter Ruth and her husband Frederick Thomas a butcher’s manager in St Mary in Berkshire. He was aged 69 and said to be married. The rate book of 1880 says that The Priory as it is now was owned by Henry Craven St John and was occupied by Caroline Lewis. Caroline Lewis was born Caroline Hume. She was the daughter of Joseph Hume and his wife Catherine Elizabeth. She was also the sister of Catherine Lloyd of Fairfield House and of Eleanor Rodney of Stokefield House. She married William George.Tredennick Lewis, on 15th February 1825. He was a Captain in the 41st Regiment of Madras Native Infantry. He was a D.A. Adjutant General at Bellary. He died 9th October 1839 aged 38 years and was buried in India. There is a memorial to him in St Mary’s Churchyard. In the 1841 Census Joseph and Catherine Hume were living in Marylebone, St Pancras. Living with them at that time were Caroline Lewis aged 38 their widowed daughter. In the 1851 Census Caroline Lewis then aged 48 and her sister in law Annette Hume were living with Catherine and Edmund Lloyd in Fairfield House. Annette Hume was the wife of Gwennap Hume, Caroline’s brother. It seems likely that some time before that Caroline had been living in 4 Castle Street. In 1854 Stokefield House in Castle Street in Thornbury was offered for sale and was said to be until lately the home of John Gwennap Hume. In 1858 John Gwennap Hume died. The probate record for 1889 says that the will was “unadministered” by his widow Anna (otherwise Annette Hume) and by his sister Caroline Lewis, a widow. In a conveyance dated 25th March 1858, Thomas Powell sold a property believed to include what later became Threeways at 56 Castle Street to Mrs Caroline Lewis. We do not believe that she lived in this property however. By 1861 the widowed Caroline Lewis aged 58 was living in Paddington in London still with her sister in law Annette Hume who was aged 43 and a widow. Annette Hume had six children; four daughters; Caroline, Mary, Anna and Eleanor and two sons; William and George. They had two servants. In a lease dated 25th March 1862, Mrs Caroline Lewis agreed to lease “a house and garden in Thornbury late in the occupation of Thomas Powell, stone cutter” to Mr Thomas Lydiatt (a shoemaker). We know this property to be at what is now Threeways. The annual rent was set at £11, payable quarterly. The lease period was to last until one or other of the parties gave lawful notice. Mr Lydiatt was not allowed to sublet it and the lease would be invalidated if he ceased to reside at the property. In 1871 Caroline Lewis was living in Old Castle House, Oldcastle in Kent. The head of the household was Annette Hume then aged 53 and described as the widow of Colonel Hume. Also living there were Annette’s daughters, Mary Dorothea Hume born in Bombay, Caroline Jane Hume born in Aden and aged 39 and Eleanor Constance Hume born in Deesa in India and aged 17. All were unmarried. Caroline and Annette’s nephew Rodney M Lloyd aged 29 and a Commander in the Royal Navy, born in Thornbury was another member of the household. In 1881 the Census shows that Caroline was living in The Priory. At that time she was said to be a 78 year old widow from Middlesex London who was living with her 36 year old niece Mary Hume. They had Caroline’s grand-nieces in the household; Ethel Hume aged 10, Christine Lloyd aged 8 and Kathleen Lloyd aged 6. They had two servants; the cook Clara Howes aged 16 and a servant Minnie Thompson aged 13. Caroline Lewis died July 21st 1882 aged 79 years and was buried in St Mary’s churchyard with a memorial to her husband. A conveyance dated 4th January 1883 recorded the death of Caroline Lewis. Her will allowed Mary Dorothea Hume, her Trustee, to sell her property at Threeways to Henry Hume Lloyd “if he would be desirous to purchase it at a price to be determined by a competent land valuer”. Joseph Young Sturge, a land valuer of Thornbury, valued the property at £192 and Henry Hume Lloyd duly contracted to buy it, the fee going to her niece Mary Dorothea Hume (the daughter of her brother John Gwennap Hume), as per Caroline Lewis’ will. Miss Ramsey. In 1885 the rate book shows Miss Ramsey. Sadly we can find no other record of a Miss Ramsey. Hatcher. The 1894 rate book shows that the house was owned by Henry Craven St John but occupied by “Hatcher.” The 1895 Trade Directory says “Mrs Hatcher” lived at The Priory. This might be Sarah the wife of the labourer William Hatcher. In the 1901 Census this couple was living with the Penducks at 2 Castle Street. William Hatcher died in 1893 aged 66. Grace Commeline. In 1891 and 1899 the rate books show that the house was owned by Henry Craven St John but occupied by Miss Grace Commeline. The 1901 Census shows that the Priory was still called Priory Cottage. At that time Grace Commeline was living in the house with one servant, Esther Spill. In 1905 the Rate Book shows that The Priory was owned by Henry Craven St John but occupied by Miss Wood. We have found no trace of Miss Wood. In 1910 the Rate Book shows that the house had been occupied by Mrs Wilson but was then occupied by Herbert Hume-Spry. The 1914 Prewett’s Street Directory shows Herbert as living in the house, but the 1915 directory shows a Miss Bennett living there. Herbert Hume-Spry bought the property at some time before 1925. In 1965 The Priory was occupied by Angela Mills. The 1975 Electoral Register shows the house was occupied by Charles Gasson and Susan Fane de Salis, whose husband had died in 1973. The 1980 electoral roll shows that number 17 (The Priory) was occupied by Charles Gasson who had previously lived at Fairfield House, 58 Castle Street.